Zooicide is a powerful book that will attract a good deal of attention from both pro-zoo and anti-zoo people, along with those in the middle-of-the-road. Zooicide: Seeing Cruely, Demanding Abolition is available from Barnes & Noble. 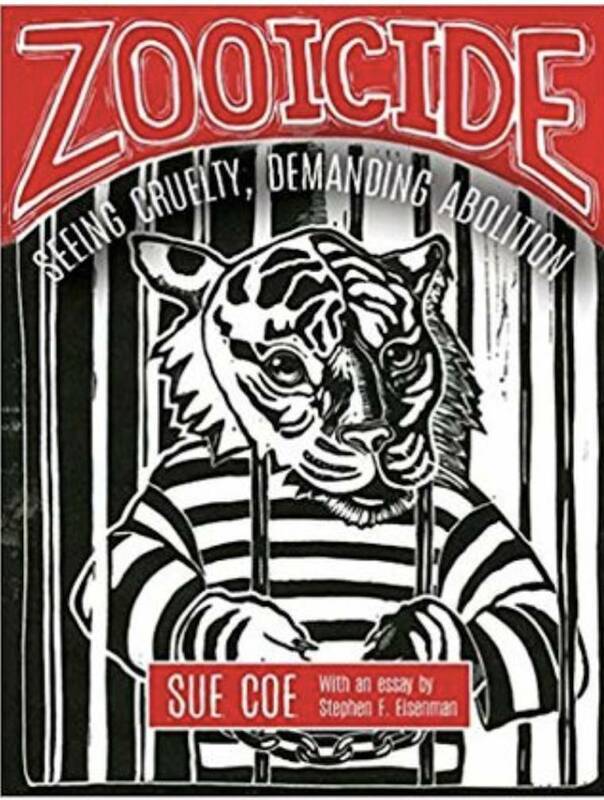 I recently received a copy of a book titled Zooicide: Seeing Cruelty, Demanding Abolition packed with riveting images by renowned artist Sue Coe that also contains an essay by Northwestern University professor Stephen Eisenman called "The Capitalist Zoo," a history of zoos written from the future—a future in which zoos as we know them no longer exist. Regardless of one's views on zoos, it's essential to have much needed discussions centering on the future of zoos and the nonhuman animals (animals)— zooed individuals who they hold in different forms of captivity. Zooicide unabashedly takes the position that zoos as we know them have to go. I asked Sue Coe and Stephen Eisenman if they'd be able to answer a few questions about Zooicide, and gladly they said yes. Here's what they had to say about their new book. Marc: Why did you publish Zooicide: Seeing Cruelty, Demanding Abolition? Stephen: We did it because zoos are one of the great, tragic, and largely unrecognized arenas of animal cruelty. Everywhere there is a zoo, mothers take their children and fail to recognize – because of all the happy, happy graphics and slick messaging – that the animals are mostly living painful, bored, frustrated, lonely, and shortened lives. Marc, you and a few others have been saying this for years, but telling the story in pictures is especially effective. Sue Coe: I started the zoo images in response to the murder of Harambe the young gorilla. Another zoo accidentally gassed his sister and mother. His entire family was destroyed by zoos. A few days after Harambe’s death, the zoo proclaimed they had ‘harvested his genetic material.' Which, scientifically is highly unlikely. It was the zoo's way of dissembling and justifying their crime. Marc: Why do you think that a combination of prose and graphic artwork is a good way to reach people and to change their minds and hearts about zoos, the focus of this book? Sue Coe: Yes, I agree with Stephen. Making figurative art opens up a dialogue. It takes time to make art, time to stand in front of wondrous animals, looking, and drawing, it slows time down, which is imperative to understanding reality. Life drawing always attracts people who are intrigued and curious, and conversation begins. It's like something was stolen from them, they were told as children they couldn’t draw or had no talent. Put the camera phone away, and take a humble pencil and a piece of paper, and see what you can draw. 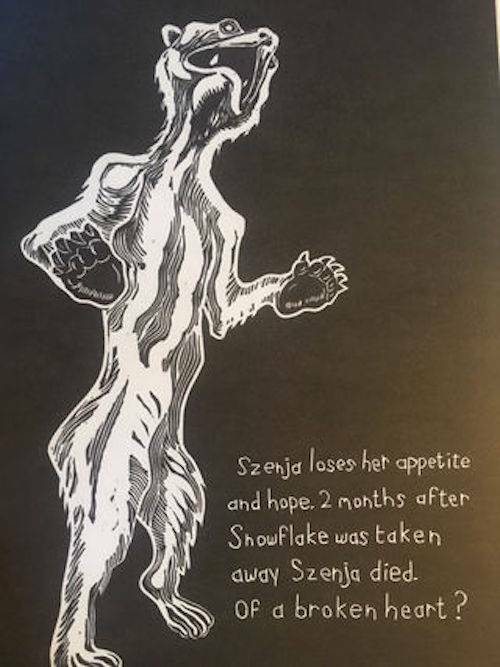 [The image of Szenja made me reflect on what happened to her after her friend of 20 years, Snowflake, was shipped to the Pittsburgh Zoo to be used as a breeding machine to make more polar bears who would surely live their entire lives in captivity. Many people wondered "Can an animal really die of a broken heart?" Yes, they can. Stephen: Zoos do not protect endangered species. By making them objects of entertainment, they may serve the opposite function. On average, zoos spend about 2-3 percent of their budgets on research. That’s it. Zoos educate nobody. The didactics at most zoos are rudimentary at best. Zoos are unhappy places for animals. Like people, they want to be free and among their kind. The biggest threat to animals is habitat loss. So, what do zoos do? They sell McDonald’s hamburgers, KFC, and every other kind of fast food grown on lands that could have been used to sustain wild populations of animals. There oughta be a law. Sue Coe: Yes, although I might differ with Stephen about the educational aspect. Children are being educated by zoos to perceive non-humans as mere props to entertain them. They and their caretakers are being educated to perceive animal bodies as either food or toys that can be purchased. Have overheard many times in zoos that animals ‘in the wild,’ live shorter ‘brutal’ lives, whose only reason for being is to search for food, and as food is supplied by a zoo, they are content. This is a falsehood, that reduces each prisoner, to a thing. Marc: What do see as the future of zoos—what sorts of reforms are needed and what will they become? Stephen: Zoos should become hospitals or shelters for sick or orphaned animals, including individuals I call liminal, wild animals – those who live among people, like squirrels, pigeons, foxes, coyotes, bears, and raccoons. But once they are well again, set ‘em free. The more people learn about the incredible cognitive capacity of animals, as well as their powers of empathy, the more they will demand an end to zoos as we know them. One day, there will be no more zoos and no more meat eaters either! The health of our planet and our souls demands it. Sue Coe: I would like to see all zoos, like slaughterhouses, turned into museums. The energy of the architecture and space is very negative. It would be like suggesting maximum security prisons should morph into hospitals and nursing homes. Zoos could become housing for the 1 percent of humans who profit from exploitation? The Koch and De Vos families already have their names stamped on the cages, so that is where they can live out their lives, and we can stroll past and gaze at them, take selfies, and marvel at how such creatures ever roamed free. Marc: Could you also briefly apply your views to other arenas in which nonhuman animals are used and abused? Stephen: Sure, we have already touched on the question of meat eating. It is a vast and unspeakable horror that has to end. And I mean has to end because apart from its incredible cruelty, it is unsustainable in a rapidly warming planet. And of course, there is animal experimentation for biomedical and other research. For the most part, this cruelty (which I have seen with my own eyes) is scientifically unnecessary. It is just inertia and special interests that keep this practice going. Sue Coe: I am against all animal exploitation, and each area requires much research. I have focused the majority of my work on farmed animals, because that is where we can have the most impact, in creating vegans, and making the connections to other social justice movements. In Zooicide we wanted to highlight how some animals are more equal than others. I have one image of a fried chicken concession stand, a few feet away from the wild bird exhibit at the Bronx Zoo. Imagine smelling the corpses of your own kind being served up in the same prison area. Mac: What do you say to people who think that abolition isn't possible and that it's asking too much? Sue Coe: From my experience, it's very little to ask. It's the least we owe to the animals. Young people are very receptive to the Abolitionist Approach. Baby steps are for babies. Bold steps are for those who want to create change. Corporate nonprofits are reluctant to educate about Abolition because they need a large donor base. It's not money that makes art or creates change, it's vision, it's hard work, it's grassroots animal activists all over the world who work their entire lives for animals, because it's their mission. Step away from the violence and do it today, it's easy. How people do this is up to them, but they need to hear the truth first, not some garbled, watered down messaging to make humans feel its compassionate to click on Donate Now, so someone else can do our activism for us. Marc: What are some of your current and future projects? Stephen: Sue and I are considering a book about animal experimentation, which used to be called “vivisection,” or cutting up of live animals. We have also been talking about a book on American fascism, which is destroying human and animals lives and quickly foreclosing a future for both. Sue Coe: Stephen and I always have lots of ideas, he has more than me, but until we start the research and put pencil to paper, we can’t say for sure. Curiosity is the driver—witnessing to see what works and what doesn’t. The creative process is too labor intensive to know what the end result will be, it has to be more than a project to which we already have the answer, it has to be a discovery. Art doesn’t become art, until the viewer says it is art, the viewer or reader participate in the process. Stephen: Sure, if you want to protect animals and habitats, boycott zoos and go vegan. You’ll feel better, the animals will do better, and you will help save the planet. Sue Coe: I don’t think the planet can be ‘saved.’ What we can do today is not participate in the violence against all life. Saving one is worth any effort, saving hundreds is a miracle. Going vegan, and creating a culture of non violence, for the world of our friends and families, including our non human family, disrupts the dominant narrative, from the slaughterhouse to our house. We have a lot of power in being creative, living on much less, sharing stuff, something the ruling class fears. They want us in a constant state of war, competition and fear, more profits for them, that way. We will evolve eventually, into non human animals and discard the ideology of profit before all life. Marc: Thank you very much for taking the time to answer my questions. Agree or not with what Sue Coe and Stephen Eisenman offer, I hope it receives a global audience on both sides of the aisle because there is much food for thought in the images and the text. I would like to see much more discussion of the notion of captivity itself, and the assumptions underlying decisions to keep animals in cages of all shapes and sizes. This was glossed, at best, at the meeting at the Detroit Zoo. At the very least I would also like to see all zoo administrators agree that forcing animals to breed, shipping them around as breeding machines (a practice which is stressful and entails breaking up groups and forming new ones at the whim of the humans), and killing healthy animals should be off their agendas. Sadly, they're not. I fully realize that reform can take a long time, however, it's also important to keep in mind that as we ponder the issues that need to be carefully examined, numerous animals continue to languish "behind bars" and suffer because they have little choice or control over their lives and have lost and continue to lose many—far too many—freedoms. Surely we can do and must do much better as zoos morph and become significantly more resident-friendly. Let's hope that meaningful reform is just around the corner. It can't come too soon for the large number of individuals we choose to confine and whose lives we totally control.